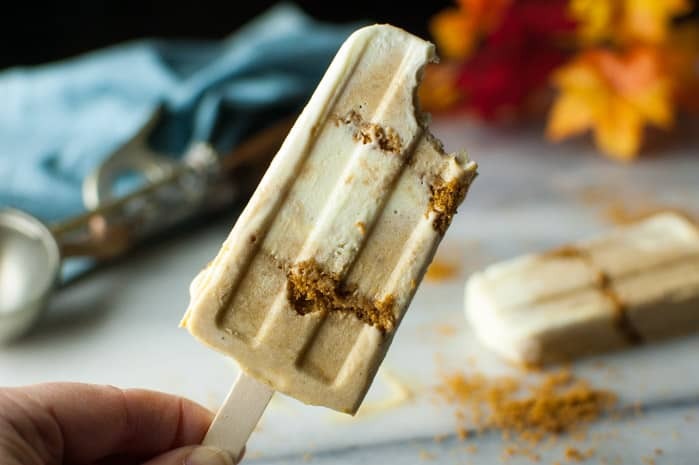 I apologize to all of you who are freezing your behinds off while raking leaves or shoveling snow, but these Pumpkin Pie Ice Cream Pops are going to warm your souls. They’re magic. Then they’ll totally melt (because of all the soul warming) and it’s going to be a big ole mess but you’ll sing fa la la la la and think: ’tis the season. It’s a freakin’ fairy tale. Here in Phoenix, it’s still warmish. Although, I did feel a slight chill in the air when it dipped into the upper 70s. I can’t believe I’m saying that. Since moving out west, my footsies get cold when it drops to 78. Cry with me. You want to smack me with your leaf rake, don’t you? I was supposed to make these back in October when we were sweltering at 90°, but since these are so doggone creamy, you’ll forgive me after a mere 30 seconds of the silent treatment. You could slurp these up easily in cold weather and they won’t melt on you. Or sit by the fire and pretend it’s summer. 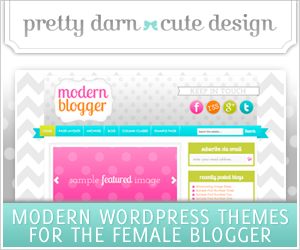 Work with me. This is probably the most decadent dessert I’ve ever made and, although they require some work, they’re sooo worth it! You’re going to make two flavors: pumpkin pie ice cream and vanilla ice cream (which tastes like whipped cream). 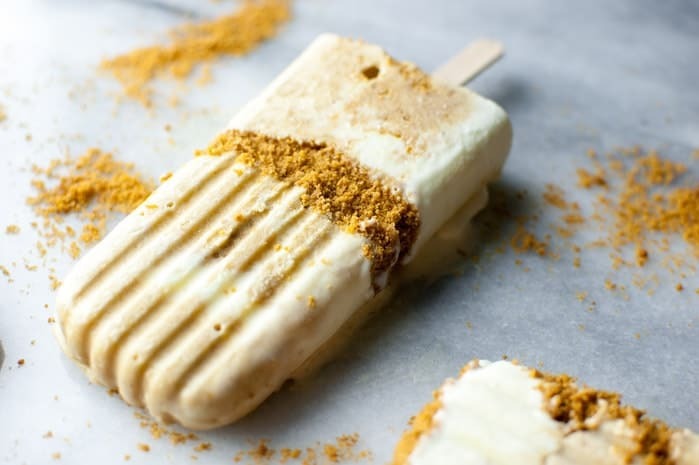 While they’re in soft-serve form, you’ll dollop them into your popsicle molds, alternating between flavors and sprinkle a little bit of crushed gingersnap cookie crumbs whenever you feel like it. You got this. You could leave out the cookie crumbs like I did on this one below (left) and then roll them in the cookie crumbs later. They’re not as pretty that way, but they are a little easier to pull out of the popsicle molds. Crush up those cookies…crush ’em, baby. I went a little overboard with this one. I think less is more with the cookie crumbs, but you get the gist. YOU GET IT. These are so on point. <– I just wanted to say that. Fill a large stock pot with warm water. Important: not hot water! 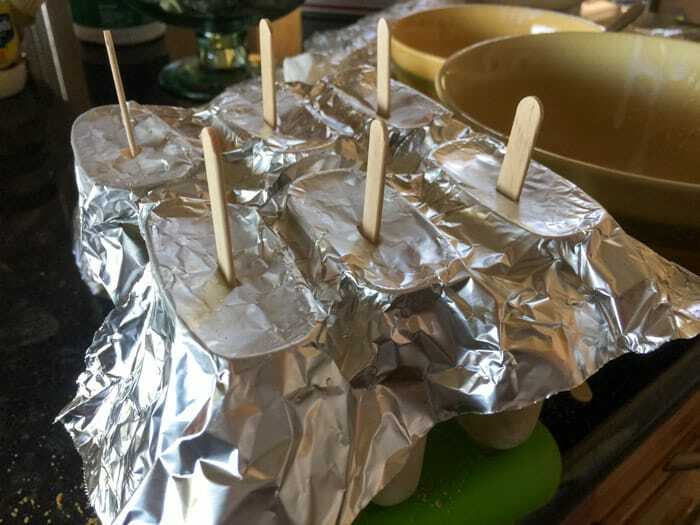 Pull the popsicle molds out of the freezer, take the lid off (or aluminum foil, if that’s what you’re using – see pic below). If for some reason, it takes you a few minutes to loosen the lid, put the molds back into the freezer for a few minutes. It’s key that the molds are ice cold before you put them into the water. Immediately dip the molds into the water, getting the water as close to the top of the molds as you can without getting water in your ice cream. You’ll probably have to hold onto them so they don’t float. Hold them in the water for 20-30 seconds. Remove molds from water and gently pull one of the popsicles sticks to get the pop out. If you’re straining too much to pull them out, STOP PULLING and put the molds back into the water for another 20-30 seconds. Try again. You should have success at this point. If not, repeat in the water for another 15 seconds. The reason you do this in steps is, you don’t want to have to pull on the sticks so hard that your stick comes out. If you’re straining to get them out, your popsicles will probably break. 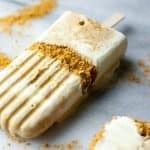 Because these pumpkin pie ice cream pops are super creamy, they melt fast and that makes them a little harder to get out of the molds. If you want them less creamy, you could use less eggs, or leave out the eggs altogether. What this will do is create a more “icier” pop and it won’t be as creamy. I thought the extra struggle was a fair trade for the creamiest pumpkin pie ice cream pops ever! And there you have it! 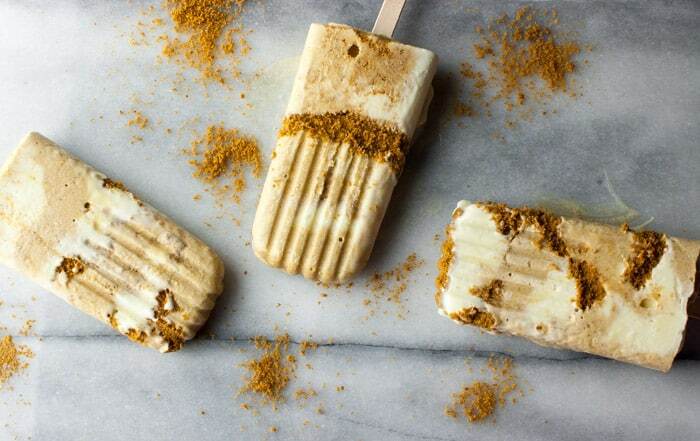 You’re going to rock these Pumpkin Pie Ice Cream Pops. When your loved one comes in from shoveling snow, say “Honey, thanks so much for doing that. Have an ice cold popsicle as a gesture of my appreciation.” Sure you may get a dirty look, but it’ll warm their heart. In a medium-sized bowl, whisk together egg yolks. Add pumpkin, cinnamon, ginger, nutmeg, cloves, vanilla, salt, and pepper and mix well. Set aside. In medium saucepan, heat up cream, half and half, and sugar, slowly over medium low to medium heat, stirring frequently. (about 4-6 minutes). Do not let it bubble or boil. Next you want to temper the egg mixture. If you poured the eggs directly into the heated milk, it would cook the eggs. Tempering the eggs will keep that from happening. Ladle out a portion of hot cream mixture and pour it slowly into the egg mixture while whisking vigorously. Continue doing this slowly, until most of the cream mixture has been incorporated into the egg mixture. Once you’ve tempered the eggs, pour all of your egg/cream mixture back into your saucepan. Cook over medium heat for another 4 minutes, stirring frequently, until your ice cream base has thickened. To test its thickness, dip a spoon into the mixture and pull it back out. Run your finger down the back of the spoon. If the clear area you swiped stays in place, it’s ready. Remove from heat and stir in bourbon (if using). Let cool to room temperature, stirring occasionally. Transfer to air-tight container and refrigerate overnight. In a medium-sized bowl, whisk together egg yolks, vanilla, and salt. Set aside. Temper the eggs: ladle out a portion of hot cream mixture and pour it slowly into the egg mixture while whisking vigorously. Continue doing this until most of the cream mixture has been incorporated into the egg mixture. Once you’ve tempered the eggs, pour all of your egg/cream mixture back into your saucepan. Cook over medium heat for another 4 minutes, stirring frequently, until your ice cream base has thickened. To test it’s thickness, dip a spoon into the mixture and pull it back out. Run your finger down the back of the spoon. If the clear area you swiped stays in place, it’s ready. Remove from heat and let cool to room temperature, stirring occasionally. Transfer to an air-tight container and refrigerate overnight. 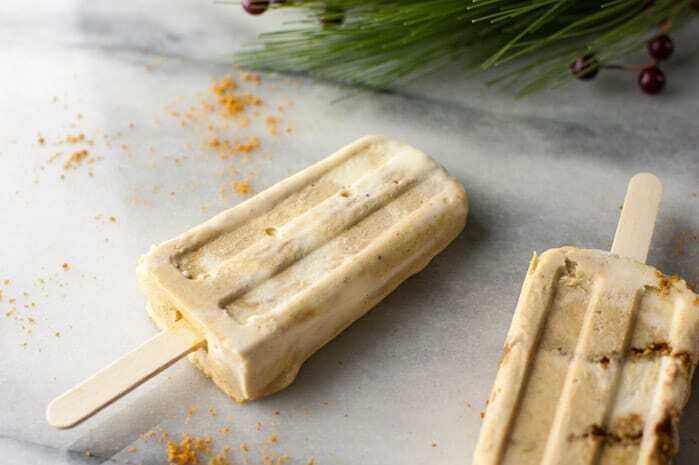 While your ice cream is churning, get your popsicle molds and wooden sticks ready. Also, crush up your gingersnap cookies with a mini food processor or by pounding them in a Ziploc baggie. Once pumpkin ice cream has been made into a soft-serve consistency, transfer to an air-tight container and put in the freezer while you make the vanilla. Don’t let it freeze to a hard consistency. Wipe out your ice cream maker’s freezer bowl with paper towels to remove frozen film from the pumpkin ice cream. 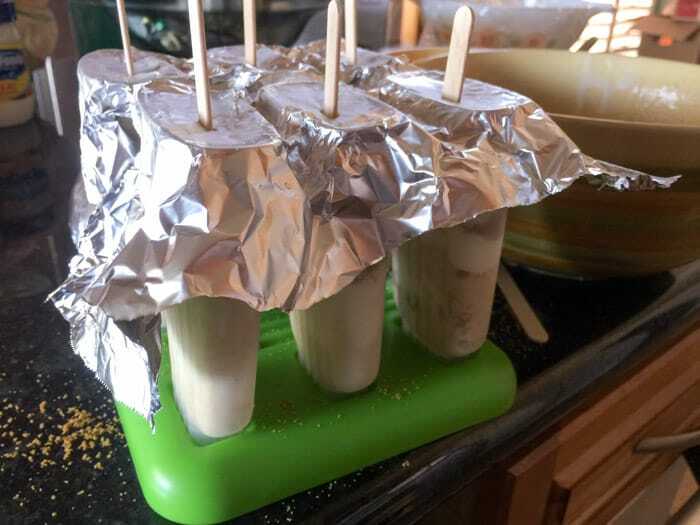 Once the vanilla ice cream has been made into a soft-serve consistency, transfer it to the freezer, if you don’t have your popsicle molds ready. Once your molds are ready, you can pull your soft serve ice creams out of the freezer. With a small spoon, scoop out alternating spoonfuls of pumpkin and vanilla into your molds. 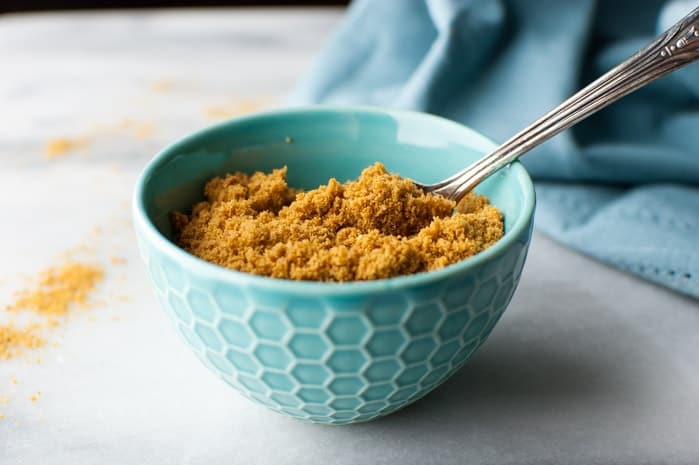 Every so often, add a small amount of gingersnap crumbs. 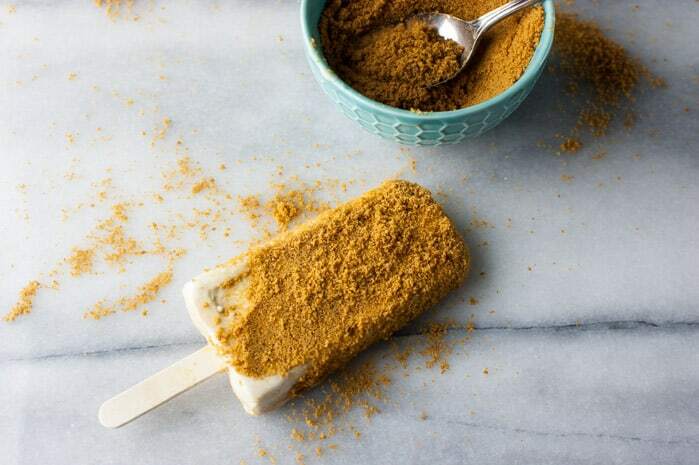 (Try not to pour too much cookie crumbs into your molds at once because this can cause a weak spot in your popsicles and when you try to pull them out after they’re hard, they can break.) Keep alternating flavors until they’re filled almost to the top but not all the way (your ice cream will expand). 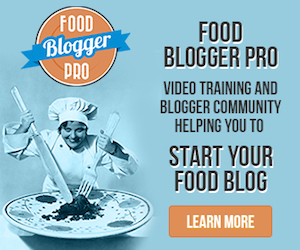 Cover with your popsicle mold lid or use tinfoil like I did above in this recipe post. Your poor 75 degree footsies! 🙂 Well I’m cold but I still want to eat every single one of these ice cream pops! Those look AMAZING and so delicious! For some reason, I hadn’t read this. Busy with the holidays, I guess! YUM!